When you are in the market for discount bathroom sinks, there are several online resources to purchase from. Whether you need a pedestal, drop-in, vanity, wall-mounted or a floating basin sink, doing your homework online will be incredibly beneficial for both your wallet and your bathroom design. 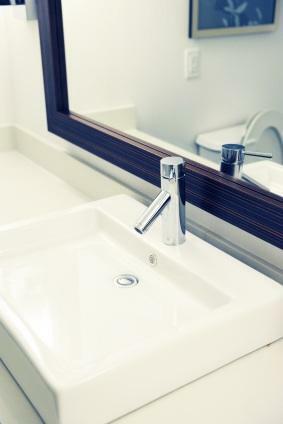 To get you started, here are a few excellent resources for discount bathroom sinks. As the name suggests, DiscountBathroomVanities.com offers a variety of bathroom sinks at incredibly low prices. The company sells many name brand products that are not factory seconds or of questionable quality. All of their sinks come with a full one-year warranty, so if you aren't satisfied with your sink, you can always return it. FaucetLine.com is a fantastic resource for discount faucets and sinks from top manufacturers, such as Kohler, Moen, Belle Foret, Toto, Jado, Rohl, and more. With more than 90 different brands to choose from, the website only sells brand-new, factory-sealed sinks and faucets. You don't have to worry about getting seconds or discards. Click on the "What's New" category to see their latest designs, or on Best Sellers for an idea of their most popular items. With just about anything you might need to make over your bath, TheBathOutlet.com is a one-stop shop for discount bathroom sinks. Choose from vanity or console sinks, as well as modern or traditional styles. There are glass and porcelain, small and large, square, round or oval, and even corner sinks for those who need a special shape. With sinks starting as low as 50 dollars, Overstock.com offers some of the best bargains on the web. Because the site purchases overstock from other companies, there isn't as wide a variety of options available, but chances are you will find something that works well with your budget and with the design of your bathroom. In addition to sinks, you can also find all of the hardware you need to install the sink, including faucets, drain stoppers, and more. After you have established the color scheme and theme for your bathroom, look for a sink that will blend nicely with the surrounding decor. If your bath is colorful and modern, you might opt for a pretty glass wall-mounted sink or contemporary floating basin atop a vanity. On the other hand, if your taste trends toward traditional or country-style, you might want a bone-white classic pedestal or a vanity with a drop-in sink. If you are willing to spend some time online and at local kitchen and bath stores, you will be certain to find a sink that fits your ideal budget and your taste.